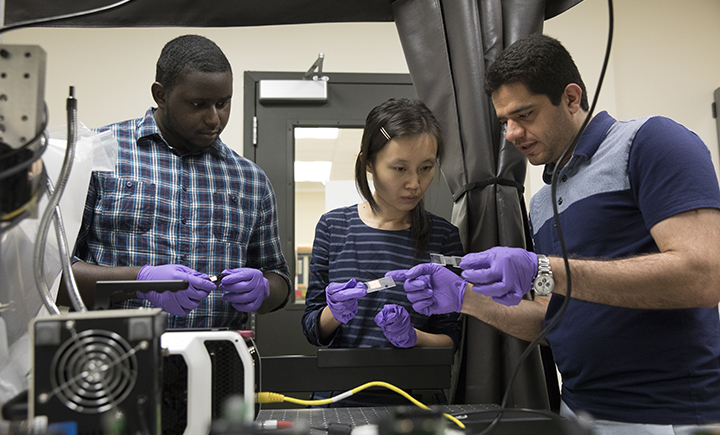 Binghamton University researchers have been working on a self-healing concrete that uses a specific type of fungi as a healing agent. Assistant professor Congrui Jin (center) with two Binghamton University graduate students from the Mechanical Engineering Department. Image Credit: Jonathan Cohen. Assistant professor Congrui Jin (center) with two Binghamton University graduate students from the Mechanical Engineering Department. Photography: Jonathan Cohen. America’s crumbling infrastructure has been a topic of ongoing discussion in political debates and campaign rallies. The problem of aging bridges and increasingly dangerous roads is one that has been well documented and there seems to be a consensus from both democrats and republicans that something must be done. Binghamton University assistant professor Congrui Jin has been working on this problem since 2013, and recently published her paper “Interactions of fungi with concrete: significant importance for bio-based self-healing concrete” in the academic journal Construction & Building Materials. This research is the first application of fungi for self-healing concrete, a low-cost, pollution-free and sustainable approach. Jin’s studies have looked specifically at concrete and found that the problem stems from the smallest of cracks in the concrete. The team found an unusual answer, a fungus called Trichoderma reesei. When this fungus is mixed with concrete, it originally lies dormant — until the first crack appears.